Ketoacidness is put into two different category types. One those categories is what this article pertains to and other is due to alcoholism. However, the one that we are discussing is called medically called Diabetes Ketoacidosis (DKA) for short. DKA is an extreme illness that happens when you have Type 1 diabetes and have not been treated for it or those who have Type 1 have not been taking their insulin injections. Ketoacidness is a metabolic acidosis that is caused by a lot of concentrations of ketone bodies that have been formed by the destruction of amino acids and the collapse of fatty acids. IT is most seen among those who have diabetes but it can also be caused by those who have been fasting or who are starving to death. The liver starts breaking down fat and proteins in order for the body to survive which causes problems internally for your body. There is no nutrition getting to your body which makes it hard for the body to stay healthy. DKA happens when the cells in your body do not have the right amount of glucose to meet metabolic orders. Ketone bodies then have to work to start making more energy through fatty acids. When you have diabetes, insulin had to be used in order for glucose to be absorb throughout the body if not then you are most likely going to develop DKA which can lead to many more problems. Hyperglycemia can also be caused through not only diabetes but DKA can cause it also, once so much glucose is running through your body it starts to overload which then starts to spill over to your urine. Once DKA has taken a hold of your body dehydration will soon arise causing even more stress on your body. DKA is very much life-threatening and should never be taken lightly. Sometimes those who have recently shown symptoms of Diabetes will be diagnosed with DKA within the hospital and of course those who have not been taken their insulin who are diabetic’s will be diagnosed with DKA also. Back in time, DKA killed a numerous amount of people because insulin injections were not yet heard of. So now that we have the technology and medication DKA can be treated successfully allowing fuller healthier lives. DKA is measured through blood pH levels; a level that measures below 6.7 is said to be diametrically opposed with life. Exams and tests that will be given to check for DKA consist of blood sugar tests, which can also check for potassium, sodium and other electrolytes. Some other tests check for keytone levels and the functioning of your kidney, also a blood gas which well tell the doctors what your ph level is at. Sometimes if your condition is not too bad doctors will want to check to see what may have brought on the DKA symptoms. This calls for an ECG, a chest x-ray, a cat scan of the brain and a urine analysis. People who have developed Ketoacidness should be hospitalized because it is not a minor thing. Those who have DKA have been said to bare a smell coming from their mouths. Either of nail polish remover, paint thinner or even the smell of fruit. Some symptoms that occur with having DKA are feeling sluggish or being overly tired. Having extreme thirst even though you are drinking rapidly, a need to urinate more often, extreme amounts of weightloss, sometimes oral thrush will be visible (which is white yeast along the inside of the mouth.) You may also find that you are having more and more yeast infections, almost continually. There will be signs of muscle wasting, since muscles are a sign of protein and DKA starts to break down proteins then you will experience loss of muscle. Those who have DKA will notice or be noticed with more moodier personality, sometimes they will feel irritated or agitated, become aggressive or even feel themselves confused or be confusing to those who are around them. There are some signs however that appear later in the DKA phase that will need to be addressed promptly and hospitalization will most likely be needed. These signs and symptoms are vomiting, loss of appetite, confusion, some flu-like symptoms, lethargy or apathy, loss of strength, abdominal pain and also a sudden loss of breath or short rapid breaths which are sometimes referred to as “air hunger.” The person doesn’t seem to be able to get enough air. Sometimes a person with untreated and prolonged DKA will experience some unconsciousness and then go into a coma, if this happens then it is imperative to get that person to the hospital as soon as possible. 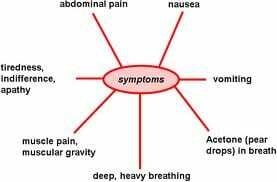 There are many complications that come with have DKA, just some of the symptoms above are minor things. There are bigger things that can occur if DKA is not treated promptly and successfully. One of those things is called Hypokalemia which simply means high potassium. Once you have high potassium it is curable but can lead to other things which can seriously affect your body in many ways. Another complications that can arise from DKA is Cerebral Edema, this means that you have some buildup of water in the spaces of your brain. As I mentioned before Hyperglycemia can occur while have DKA, which means you have a large amount of High blood sugar. Some people will also experience Ketoacidemia this is when your urine takes on the smell of maple syrup. Other conditions in which can occur is Pulmonary edema which is swelling and fluid build up in the lungs and a Myocardial Infarction otherwise knows as a heart attack. Some treatments that will be done to make sure you are on a successful track to gain control over DKA is fluid replacement, electrolyte replacement and intravenous insulin supply. These three things are key to making you feel healthier and making your body healthier all in one. Insulin will help the diabetes and the glucose to exactly what they are supposed to be doing while the fluids will help your body to feel hydrated and start to run more properly. Once this happens and you are feeling better and out of danger your doctor will start to find out what caused DKA in the first place and then he/she can start to treat that. DKA does not always turn out successful but if you get treated at the first signs you are better on your way to feel better and being healthier.